As you can see, it was the most awesome tweet EVER. *Enter sarcasm. (Allow me to set this tweet up with a little background knowledge….I’ll be brief.) I have some wonderful memories of playing Wii with my husband and son – my son would have been 6 at this time. This was also the Spring of my first year as a principal. That’s really what prompted me to check Twitter out ; a desire to be a tech-savvy leader. But this first tweet, proves quite effectively that I hadn’t yet considered Twitter for professional development. As you might have guessed, I didn’t put in or get out much from Twitter for the next few years. And I certainly didn’t get #hashtags. At. All. It wasn’t until late 2012 and early 2013 that I would truly begin to understand how Twitter could help me be a better educator, a better leader, and in-touch with trends/practices from around the world. Why am I recapping my journey through the Twitter world? Well, I guess it’s my hope that someone who is reading this has felt the same way about Twitter that I did several years ago. Or maybe there’s someone who currently feels like it’s not that useful. I’m speaking to those who believe you can’t learn much when you’re limited to 140 characters. Or who believe they have enough to “do”, and Twitter is just one more thing to have to “do”. Let me share just one way being connected on Twitter has helped me in my role as a Principal. (Who knew narrowing it down to one way to use as an example would be so challenging? I would LOVE to share ALL the ways Twitter helps me, but I would be writing until the cows came home!) Did I mention I live on a farm? That’s a whole other story…and benefit of Twitter that I’ll get to in a minute. Back to my example. One of the #OklaEd chat topics was flipping your classrom or “Flipped Learning”. As I participated in the chat, I remember wondering how I would “show” my teachers what this might look like in their classrooms. After the chat, I tweeted back and forth with Scott Haselwood, @teachfromhere, a math teacher who had been flipping his instruction for some time. He sent a few resources my way, and even messaged his email to me so that I could contact him if I could find a day for him to come to Vici and share the flipping “awesomesauce” (If you know him, you know this sounds just like him.) Unfortunately for us, Scott hasn’t had the experience of traveling to our little town in western OK where the burgers are greasy and pattied by hand at the local cafe to share his ideas on flipping instruction. (The invite is still open, btw.) 🙂 But, after pouring over the resources he sent and doing my own research, I decided I could make an attempt to flip my staff meeting. My goal was solely that teachers would become exposed to the idea and gain a knowledge base for future conversations. Several days prior to the meeting, I emailed a link to a video on the Teaching Channel to all of my teachers. I simply asked that they watch the video prior to the meeting (at their convenience) and come to the meeting with 2 strategies they observed in the vidoe that they liked or thought they might be able to employ in their classrooms. So, at the meeting, instead of spending 10 of their precious minutes (teacher’s minutes outside the classroom are precious) watching a video together, we were able to get right to the conversation: learning and discussing strategies together. 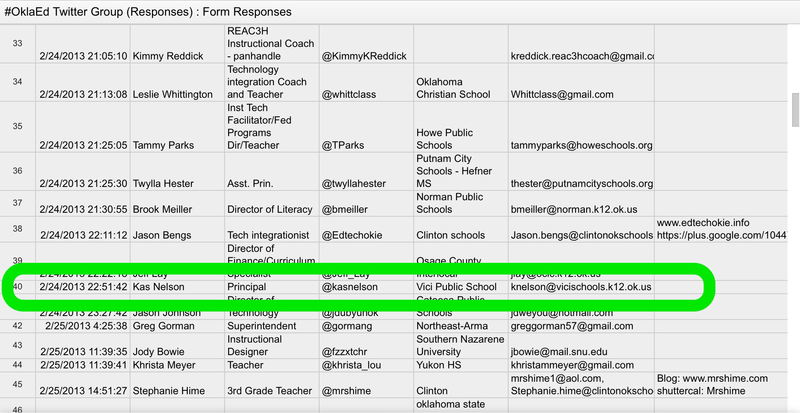 I would NEVER have done something like this if it hadn’t been for Twitter and the discussion we had on the #OklaEd chat and hashtag. Twitter spans the globe. The fact that I, a Principal at a small school in rural NW Oklahoma am able to connect and learn from people, educators, leaders from all over the world still amazes me. If you had told me 10 years ago that I would be communicating with other educators from places like Maryland, Missouri, California and Texas over the internet, I would have thought you were crazy. Now I look back and can’t imagine NOT learning from these colleagues on a daily basis. Twitter is FREE and it gives you the POWER to control your OWN professional development. Last thing, I promise. Twitter is FREE and it gives you the power to control your OWN professional development. Can’t go to that conference in another state, like ISTE, for example? No problem. I’ve never been able to go to ISTE. But I follow the hashtags #ISTE2015 and #notatISTE15, and it’s ALMOST like I’m there. I’m learning, and I’ve saved my school a lot of money! What superintendent wouldn’t push Twitter for PD if it would save money for schools? Finally, and most importantly, Twitter gives you the power when it comes to your PD. There is a hashtag for every grade level and subject you can think of. Want to know what strategies other fifth grade teachers are using, check out #5thchat. Are you a rural educator like myself? Join the #RuralEdChat. Just interested in education in general, follow #edchat. Cybrary Man has compiled a Twitter Chat schedule. You just have to search for the chat with the hashtag, and start reading. I bet you find some pretty useful tweets in a matter of moments. So what are you waiting for? I dare you to join Twitter, participate in the #OklaEd chat, (and others if you’d like) follow some of the participants and begin to grow your PLN. You’ll see only too soon, that you’re well on your way to learning and becoming an engaged educator! Previous postSocial Media is a BIG Deal for a SMALL School. Next postTop 10 To-Do’s for Back to School!